I am always on the lookout for smoothie makers to review and this week, I came across a nifty little gadget called the Cuisinart Blender CPB-300 which is a portable blending and chopping system. Let me tell you, it is the kind of blender I have been looking for. Its sleek stainless steel design looks amazing and the touch screen with LED lights definitely had my attention. It comes ready for all of your chopping and blending needs with a 350 watt powered motor and easy blend blade assembly. Not only is it compact and portable, it only weighs 7 pounds. I was very impressed with all of the safety features on this Cuisinart Blender. First off, there is a standby mode. So if you must stop and tend to your children, this machine will wait for you to return. You never know what can happen when your back is turned, so this is a feature I found most helpful. There is also a safety mode for cleaning and an auto stop feature. They truly did put a lot of thought into designing this blender. 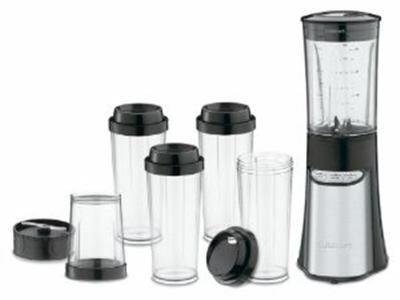 It comes with a 32 ounce blender cup and an 8 ounce chopping cup. Not to mention it also comes with four 16 ounce Togo cups, all with lids. The chopping cup is the most amazing part about the Cuisinart CPB-300. It can chop some of the most difficult ingredients such as flax seed or coffee beans. I have even read that this is ideal for grinding fresh cocoa beans. Imagine a fresh cup of homemade cocoa brewed from fresh cocoa beans. The very thought warms my heart. 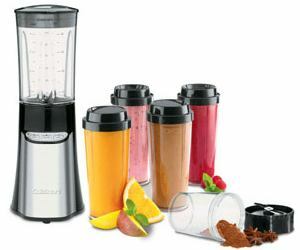 The Cuisinart Blender CPB-300 is also ideal for making protein shakes and fresh smoothies which, of course, are perfect for those on the go and those serious about living a better, healthier lifestyle. For a protein shake, all it takes is a little crushed ice, protein powder and sometimes a little fruit to give it that extra taste and fruit vitamin goodness. For a smoothie, it is as simple as using items you probably already have in your fridge. Things like yogurt, ice cream, and fruit. That is the great part about this blender. It allows you to use your imagine and blend, blend, blend. So if you enjoy a delicious smoothie or a powerful protein shake on the go, maybe you enjoy snow cones made right in your kitchen, or if you like to be the life of the party, this is the blender that stands out above all the rest! This Cuisinart Blender in my book, aced the test for versatility, practicality and price!